I have been struggling with what to name this thing… I mean. How do I even name this without it sounding dirty? It was hard, but I think I did it. Say hello to the Surprise Ball: For Your Dude. Yup. It’s a surprise ball…. 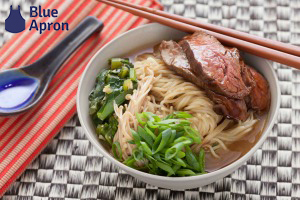 for your man. Ha! 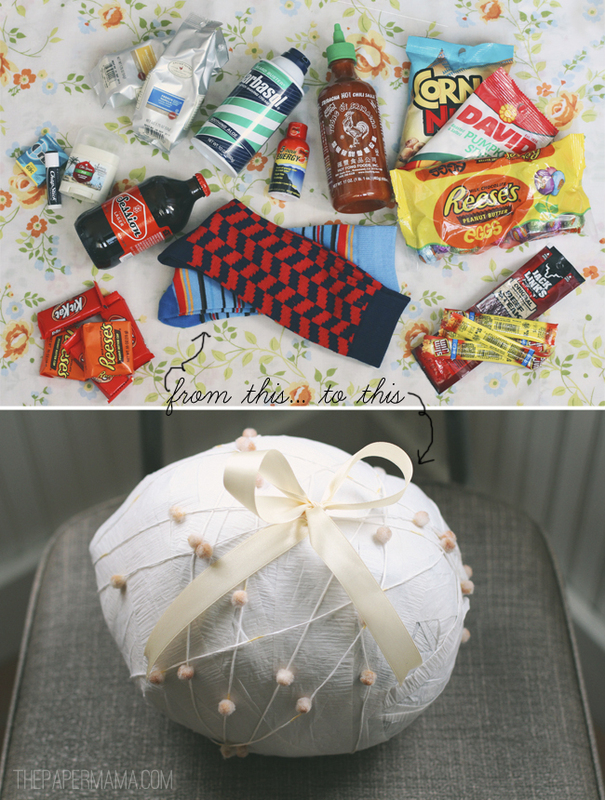 A man surprise ball package (see dirty, or maybe it’s just me). What’s a surprise ball you ask? Well, it’s a ball of crepe paper and goodies. Typically these are for kids. In fact, I made about 10 kiddo surprise balls for R’s birthday party in December. The kids LOVED them. They were all distracted for a good 34 minutes. For Christmas I made a “lump of coal” for my uncle. It pretty much had everything in it as this ball, but in the center was a gift card. – a whole package of Reese’s easter eggs…. How do you make a surprise ball? 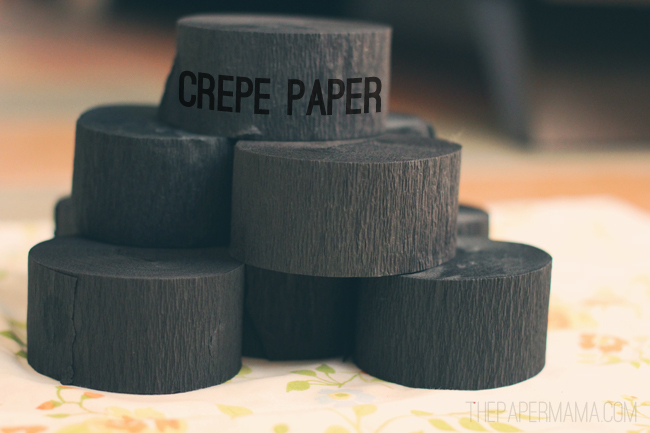 You need quite a bit of crepe paper. I used 5 rolls of black and one roll of white. I didn’t pay attention to how much was in each roll, but I’d say getting 6 – 7 would be safe. Try and put the larger items in the center. Some people like to do one continuos strip of crepe paper. I don’t. I tore off 1 – 2 yard sections to wrap each prize. I started with the Siracha, then shaving cream, and beer. From there I just tried to place items to make it look more like a ball. The socks and snack bags were helpful to soften corners. 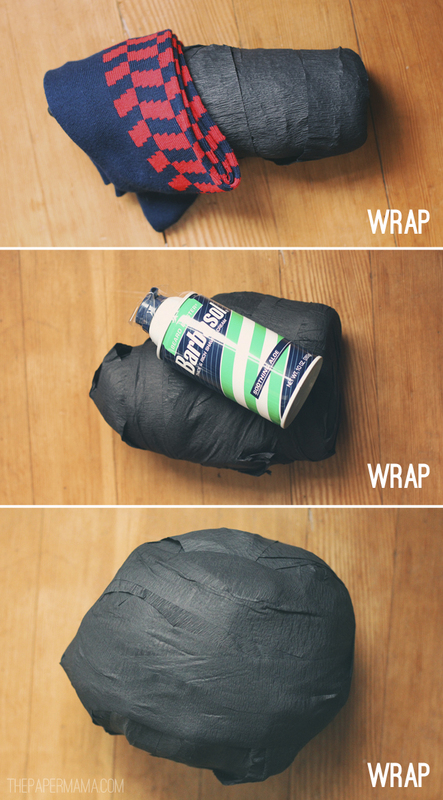 Wrap, wrap, wrap. Surprisingly… it only took just over an hour to wrap the whole thing. When you’re done maybe add a bow? Pretty ribbon wrapped around it? A tag? 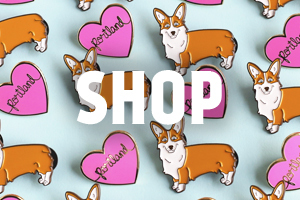 Give to your favorite dude in your life, and have fun. 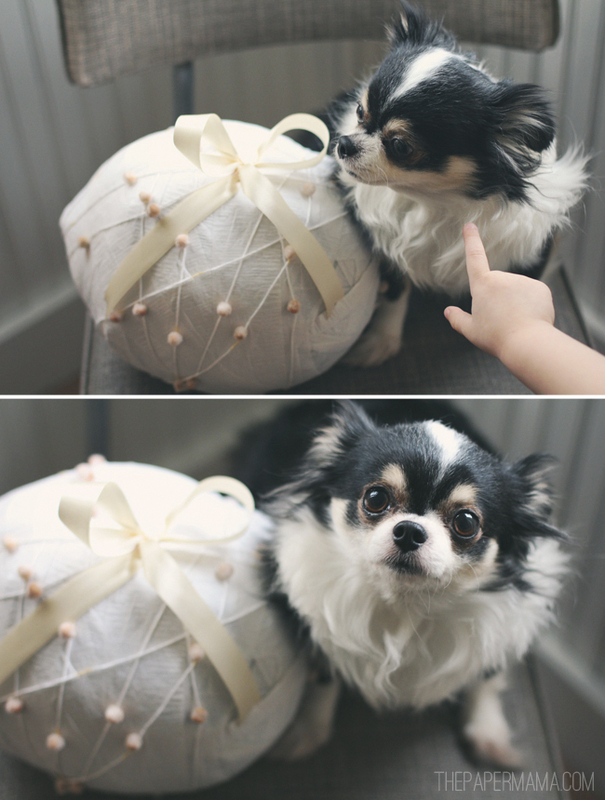 If you’re curious about the actual scale of this surprise ball I placed my Chihuahua, Angus, next to it. He’s 6 pounds. P.S. he always looks terrified. ALRIGHT! Happy Monday to all of you. 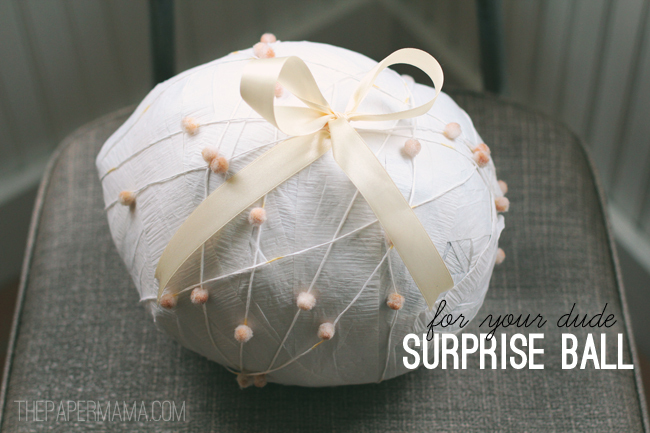 Have you ever made or received a surprise ball? This is such a good idea! I'm totally going to make one now! Awesome idea and love the ball jokes lol. What a great idea! This looks like great fun for all involved!! What a great idea. I remember something like this at a birthday party when I was younger. 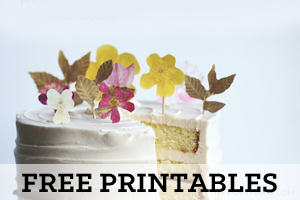 It would be fun to do these as Easter eggs and doing them in lieu of baskets! Such a cool idea! The gift that keeps on giving, literally! 😉 Thanks for sharing. Adorable! What a cute little idea, thanks for sharing!